The rotator cuff is the group of four muscles and their associated tendons of the shoulder that surround and stabilize the shoulder joint. The rotator cuff is made up of the supraspinatus muscle, the infraspinatus muscle, the subscapularis muscle, and the teres minor muscle. 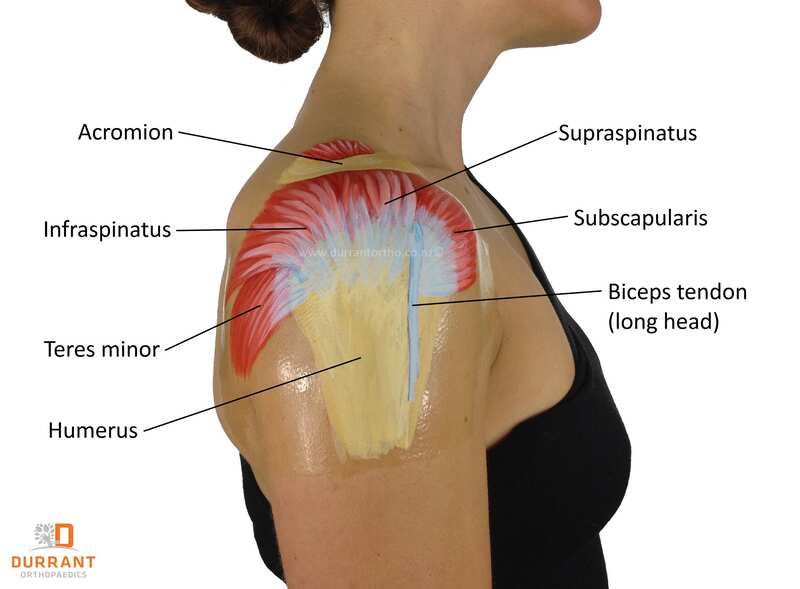 The rotator cuff attaches the scapula, or shoulder blade, to the upper arm bone, or humeral head. These four muscles create a ‘cuff’ around the ball and socket joint of the shoulder. Rotator cuff injuries may include an impingement injury or a tear. An impingement injury is where the tendons can become inflamed and irritated due to rubbing across the underside of the acromion. A tear injury is where the fibres are strained or torn. They are graded into three categories; category I involves a straining of the muscle and/or tendon fibres, category II involves a partial tear of the fibres, and category III is a total tearing of the muscle and/or tendon fibres. A rotator cuff injury may be caused from an acute injury, such as from a fall or motorbike accident, from straining and overuse such as with athletes or regular lifting, or from gradual degeneration with ageing. The main symptoms of a rotator cuff injury include pain, usually experienced in the front of the shoulder during movement, and reduced range of motion of the shoulder joint, especially the lifting movement of the arm up to the front. These symptoms are caused by the inflamed muscles rubbing against the bony structure of the acromion. With acute rotator cuff injuries the person may experience a tearing feeling in their shoulder which will cause intense pain down into the arm. With serious rotator cuff tears the arm may not be able to be lifted away from the body unassisted. The person may also be able to pin point the exact spot where the pain is most intense, usually indicating the location at which the tear has occurred. Symptoms of chronic tears, which normally affect the tendons within the shoulder, include pain which increases at night, and a gradual increase in pain and weakness within the joint. The joint affected is often on the dominant side. Immediate treatment of a rotator cuff repair includes putting an ice pack on the shoulder and resting and supporting the arm with a sling. However care should be taken not to use the sling for any extended period as the shoulder may stiffen and cause further problems. Anti-inflammatory drugs will help with any swelling and pain experienced. Medical treatment usually involves physical therapy in order to regain and maintain full range of motion and strength of the joint. A steroid injection may be required to ease the pain in order for full recovery to be made. The steroid injection will enable use and movement of the shoulder. If the tear is severe or pain and stiffness is not easing within a few months of the injury, Mr Durrant may recommend surgery on the affected rotator cuff. Rotator cuff surgery is often required if the tear is complete. Often surgery is performed on patients with partial tears where pain and lack of full movement is still present after a few months of medical treatment. Surgery on patients who are under the age of 60 has been found to offer the best chances of recovery in high grade partial rotator cuff tears. The aim of surgically repairing a rotator cuff tear injury involves reattaching the tendon to the humeral bone. Mr. Durrant will do this by inserting sutures that are attached to ‘anchors’. These anchors are inserted into the humeral bone and the suture is used to tie the tendon in place against the bone. This surgery can be performed arthroscopically or open. Arthroscopic surgery involves a few small holes being made in the shoulder where a long thin fibre optic camera is inserted into the joint, along with some long small instruments. Arthroscopic surgery has a number of advantages over open surgery. With arthroscopic surgery recovery time is shorter and pain, swelling, and bleeding is minimised. 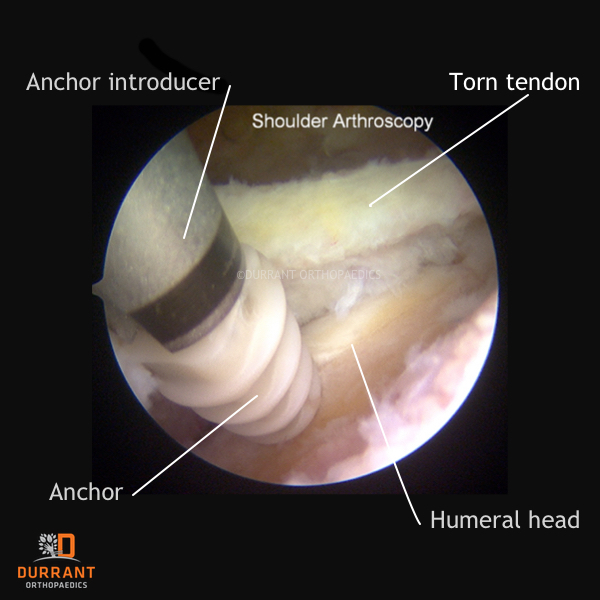 With arthroscopic surgical repair of a chronic rotator cuff injury Mr Durrant is able to view the joint internally, and is better able to remove any damaged muscle tissue or bony prominences that may be causing problems. Please contact Mr. Adam Durrants office for more information on Rotator Cuff Injuries or for additional resources on other shoulder related injuries.